out - of - focus areas of a photographic image. This is another version from a series of shots I took that evening. There's a nostalgia shooting at that focal length. 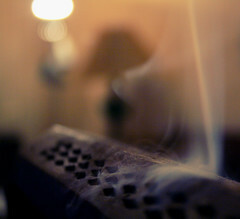 Said image is some "coffin like" incense holder from one of the local Muslim shops.